Treat yourself to an unforgettable evening at Vaux le Vicomte with a visit to the chateau and Carriage Museum, followed by a sumptuous dinner capped off with a spectacular fireworks display. 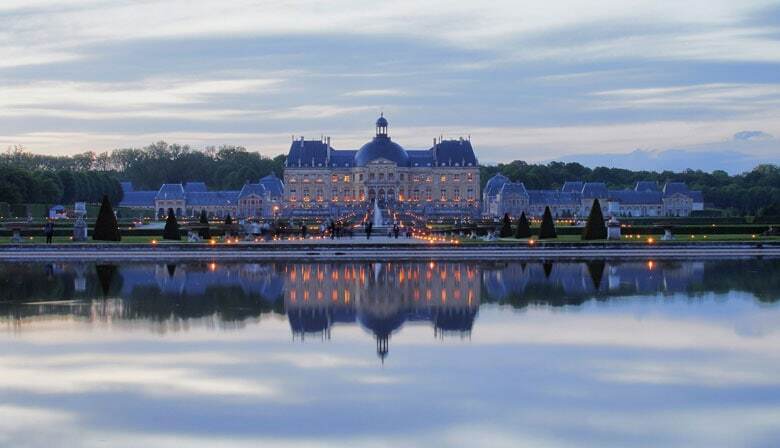 Meet us at the PARISCityVISION office at 5:00 pm, for a departure at 5.30pm, to climb aboard our air conditioned motor coach that will take you to Vaux le Vicomte, just 30 miles from downtown Paris. You will arrive at 6:45 pm and kick off your evening with a tour of the Carriage Museum. You will have an hour of free time to spend in the former stables of the Château de Vaux le Vicomte. The collection of horse-drawn carriages and coaches and period costumes will take you back in time, bringing the past to life. After exploring the chateau and museum, a sumptuous dinner will be served at Les Charmilles restaurant. Over the course of one-and-a-half hours, you will savor refined, traditional cooking in a charming setting with views of the estate lit up by thousands of candles. At 9:30 pm, you will enter Chateau de Vaux le Vicomte for an intimate, self-guided tour through the candlelit rooms. The chateau, a private residence built by architect Nicolas Fouquet, opened its doors to the public in 1968. Thanks to Charles Le Brun, Louis Le Vau the landscape designer André le Nôtre, who made the gardens a perfect example of French-style gardens with its water features and optical illusions, the chateau cultivates a unique harmony that was the envy and inspiration of many other European chateaus. For example, Vaux le Vicomte served as a model for the Palace of Versailles, which was built by the same team. After making your way through the fully furnished interiors of the chateau which boast magnificent, perfectly preserved pieces from the 17th century, you will be keen to wander through the garden's paths, which will be lit by thousands of candles to create a romantic, dream-like ambiance. You can roam through the chateau and its luxurious gardens until 11 pm,when the evening culminates with a dazzling display of fireworks shot from the grounds of Vaux le Vicomte. Prepare yourself for 10 minutes of intense sensations as you watch the colorful spectacle unfurl above your head, set to traditional music. After this unique experience, you will return to our panoramic motor coach to return to Paris. The departure from Vaux le Vicomte is scheduled for 11:30 pm to arrive in Paris just after midnight. End of the trip to Paris: Removal to Montparnasse, Châtelet and Opera at about 1:00. Location is superb. Perfect evening trip. Dinner quality is a personal taste, so no comment from me. Dinner for two would have been a romantic encounter occassion for couples when dinning outside with the chateau on the background, but unfortunately we were unlucky on 9 June 2018 to have rain forecast for that evening and had to move inside for our dinner. Although I can understand their precautions (it did not rain though until after our dinner), I would have appreciated it, if they would have left 1 table and chairs setup outside to give the people a chance to make some pictures of (fake) dining outside with the castle in the background. But hélas they had not thought about it and despite my request, they were not willing to do so. (Audio) Tour inside castle and garden illuminated by candles was pleasant. Tour was completely according to info displayed on ParisCityVision website. Info/guidance by guide during tour was satisfying. I would recommend this tour.